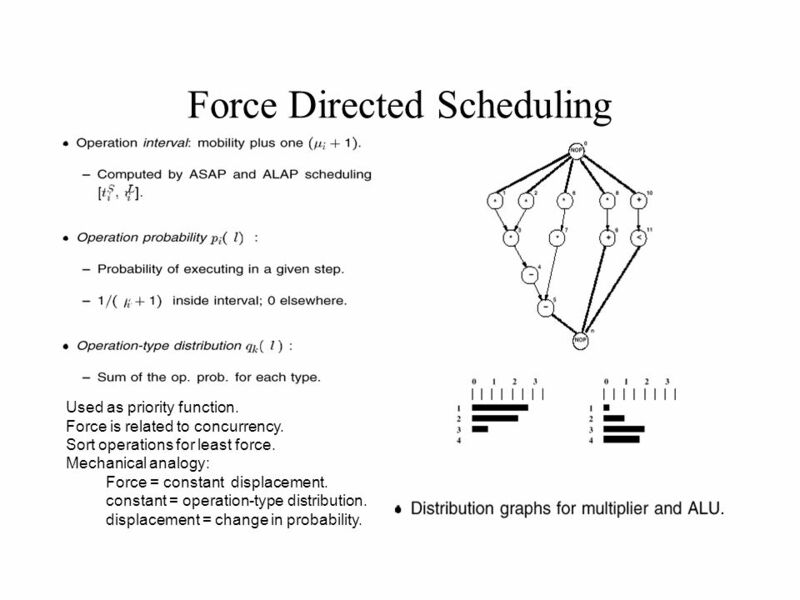 Force Directed Scheduling Used as priority function. 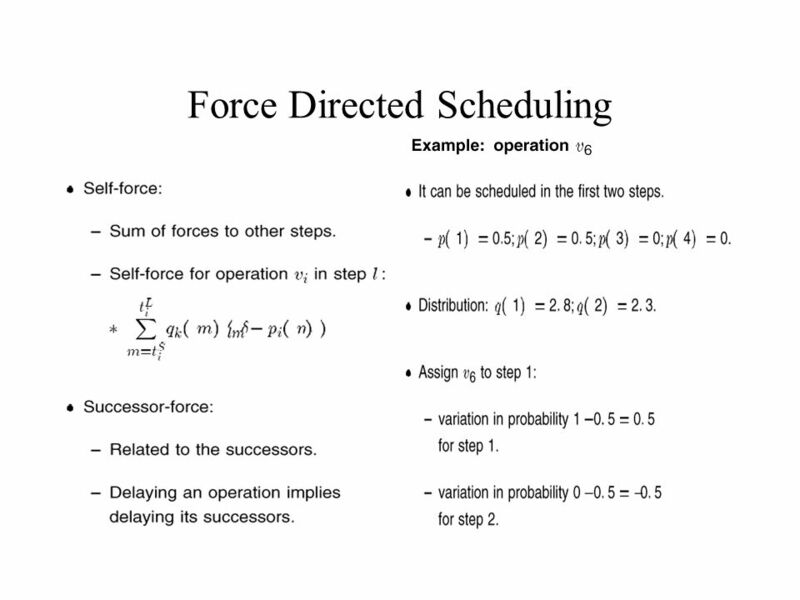 Force is related to concurrency. Sort operations for least force. Mechanical analogy: Force = constant. 1 Force Directed Scheduling Used as priority function. 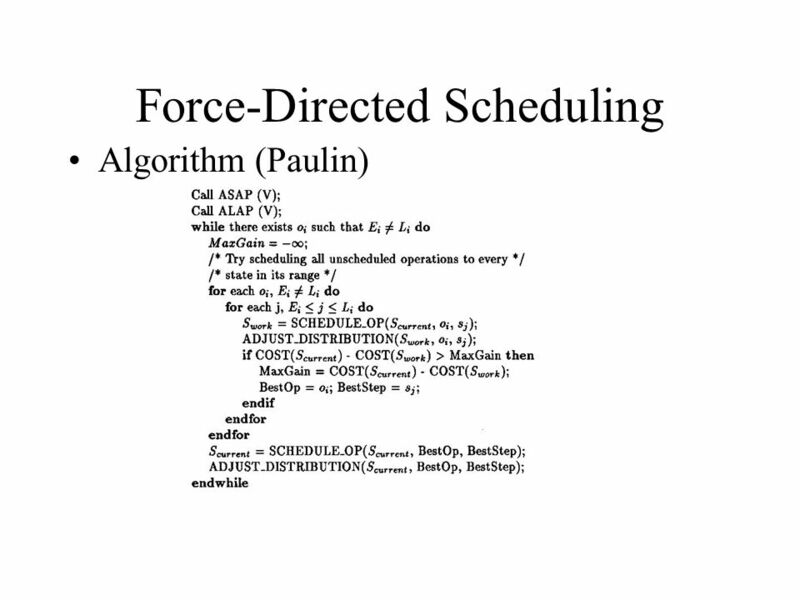 Force is related to concurrency. Sort operations for least force. Mechanical analogy: Force = constant displacement. constant = operation-type distribution. displacement = change in probability. 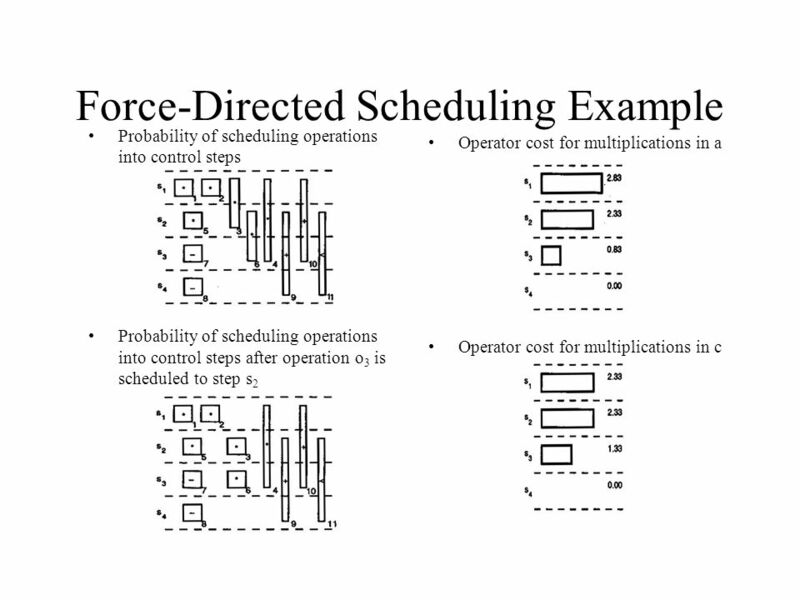 Download ppt "Force Directed Scheduling Used as priority function. Force is related to concurrency. Sort operations for least force. Mechanical analogy: Force = constant." and 6.855J Modified Label Correcting Algorithm. 1. Find the cost of each of the following using the Nearest Neighbor Algorithm. a)Start at Vertex M.
Distributed Constraint Satisfaction Problems M OHSEN A FSHARCHI. 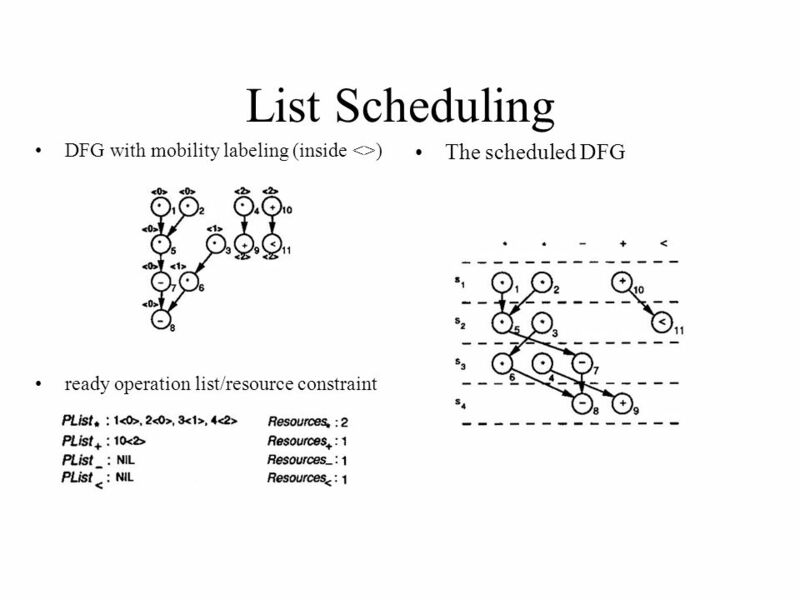 ISSS ’98 University of Rennes I IFSIC / IRISA C.Wolinski Hierarchical Conditional Dependency Graphs for False Path Identification A.Kountouris, C.Wolinski. CS223 Advanced Data Structures and Algorithms 1 Greedy Algorithms Neil Tang 4/8/2010. COE 561 Digital System Design & Synthesis Scheduling Dr. Aiman H. El-Maleh Computer Engineering Department King Fahd University of Petroleum & Minerals. Physics Lab 1 Graph Matching Mr. Chin-Sung Lin. Kinematics. Jen Sites A student taking Management Science 301 at East Haven University will receive one of the five possible grades for the. German Priority Programme 1648 Software for Exascale Computing. Priority Queuing Achieving Flow ‘Fairness’ in Wireless Networks Thomas Shen Prof. K.C. Wang SURE 2005. Final Exam Coverage. E/R Converting E/R to Relations. SQL. –Joins and outerjoins –Subqueries –Aggregations –Views –Inserts, updates, deletes –Ordering. 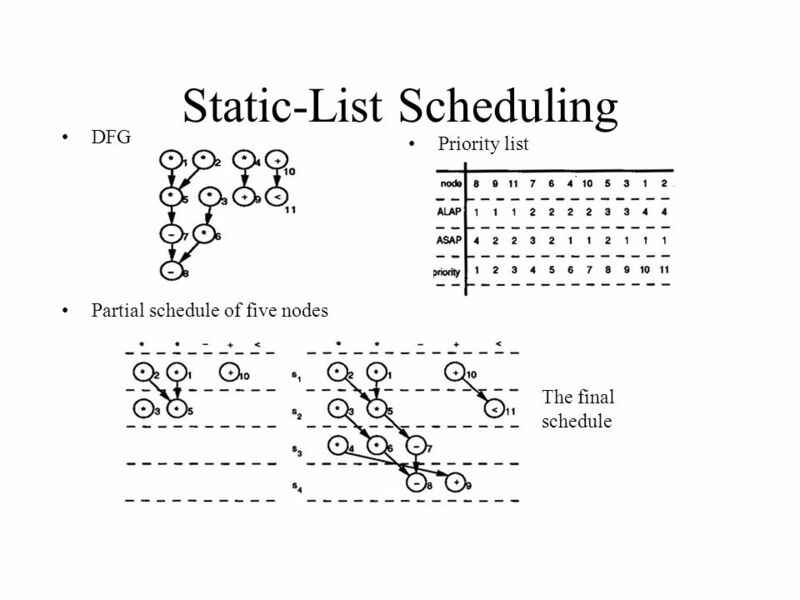 CISC October Goals for today: Foster’s parallel algorithm design –Partitioning –Task dependency graph Granularity Concurrency Collective communication. CS-3013 & CS-502, Summer 2006 Multimedia topics (continued)1 Multimedia Topics (continued) CS-3013 & CS-502 Operating Systems. Real-time Query Processing Roger Blake CSC 536 May 2, 2005.